In case you missed it, leading procurement consultancy Source One Management Services recently announced the full launch of its Spend Analysis as a Service, www.SpendConsultant.com. The web platform is a response to a growing challenge observed in the industry: companies adding to the complexity of gaining spend visibility by introducing more complexity. Meaning, companies seeking an alternative solution to conducting a manual spend analysis turn to spend analysis software. The automation of a spend analysis software can seem heaven-sent. The problem however lies in the extensive process of identifying the right software provider, pulling in IT and Finance stakeholders, and hopefully successfully integrating the system into existing infrastructure. Not to mention, these systems often use industry standard taxonomies for classifying spend (NAICS, UNSPC, etc.) that aren't conducive to strategic sourcing initiatives. Source One's Spend Analysis as a service, www.SpendConsultant.com, addresses these challenges. As a web platform, there is no system integration or implementation necessary. Simply submit your spend data and Source One's spend management experts will get to work quickly and comprehensively cleansing and classifying your data. When complete, simply login to the easy-to-navigate online tool to drill into your spend profile and see customized tips for addressing your spend categories. 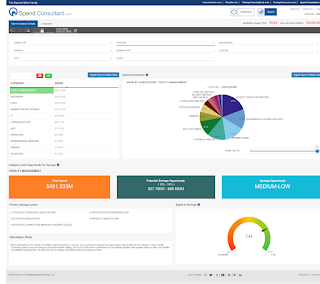 SpendConsultant.com utilizes a customized taxonomy that segments spend in a way that is conducive to strategic sourcing initiatives. Source One's spend analysis isn't a regurgitation of your spend data, its an actionable report that is designed to enable your spend management initiatives.